Sanasa Development Bank brought you a special 7 Years leasing option for your hybrid and electric vehicles with a better leasing values. If you thought of buying Hybrid vehicles you can pay down payment of 30% and Balance 70% will source by Sanasa Development Bank Leasing and if you consider Electric Vehicle Pay 10% of the value as down payment and balance 90% could be source by Sanasa Development Bank Leasing. SDB Leasing is a leasing facility for vehicles, equipment and machinery. SDB Leasing is an efficient, friendly service offering flexibility and competitive rates. Sri Lankan citizens over 18 years of age who have the repayment capacity and meets the SDB credit criteria. 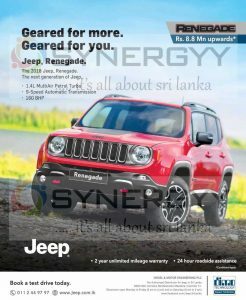 For more details about the features and specification Click Here to visit Jeep Official website. 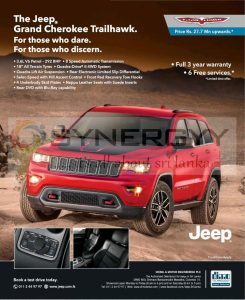 DIMO brought you the latest brand new Jeep Grand Trailhawk for Rs. 27.7 Million upwards with Full 3 year warranty & 6 free services. Vallibel Finance announces an all-new leasing package especially for Jeep Renegade Rs. 74,181/- upwards per Month*. Asia Exhibition Organised an Seylan Colombo Motor Show 2017 from 18th to 20th August 2017 at BMICH on 10th Consecutive Year. This Colombo Motor Show is one of the few highlighted event held in BMICH every year and attracts much more automobile enthusiastic at BMICH. As expected the new government budget for 2016 introduce new valuation system for imported vehicles, this valuation lead to increase prices of imported vehicles by Rs. 200,000 up to Rs. 2.5 million. The new valuation system was introduced recently taking full option manufacturers price as the tax base and the Finance Minister Ravi Karunanayake said in budget proposal that this is to further strengthen this process of collecting the payable taxes said that the unit rate of excise duty for the vehicles on the basis of cubic centimeters and duties on the percentage basis on certain vehicles would be revised. Meanwhile, 2016 budget has reduced excise duty to 2.5 percent for the vehicles which are run entirely on Solar, Hydrogen or Helium. 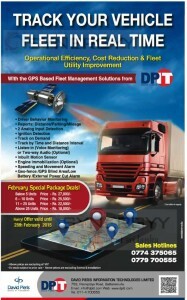 David Pieris Information Technology Limited introduces Fleet Management Solutions for the first time in Sri Lanka. Fleet Management Solutions is a well recognized vehicle management services in western countries, now it is available in Sri Lanka for you to maintain your fleet well. As news stated the Customs Director General Jagath Wijeweera inform the customs department is deciding on the value of brand new vehicles instead of accepting the declaration by the importers. This has decisions has make in the detail investigation on vehicles importers undervalued the vehicle valuation while imports, its including few leading companies too. This approach has reduced tax incomes to the government which is a considerable amount in total. Therefore the customs has set up valuation committee to determine the value of the vehicle and thereby impose the valuation tax. The New taxation systems are expected to lead to a vehicle prices increase between Rs. 400,000.00 to Rs. 500,000.00. But this system will help government to raise their tax revenue to the government. It is expect to be applies for those who imported and yet to clear them. Makesure it is not to impact to the law budget vehicles which are mostly purchases for the self-businesses or small businesses like three wheels, Small cars for Budget taxi and motor bikes. Understand the weakness and wholes in old tax systems and make alerts to income tax department or customs to be aware of those lopes whole. Be tight with rules and regulations and need to take actions against those to violating this new impose tax systems. Ministry of Transport organised an exhibition and Auto transport show from 25th, 26th and 27th April 2014 at BMICH. The exhibition will inclusive of International Bike Stunt, Vehicle show, Go Cart Racing, 4X4 offroad Show, Live DJ, Gaming Zone, Road Safety Campaigns and win Free Air Tickets too. 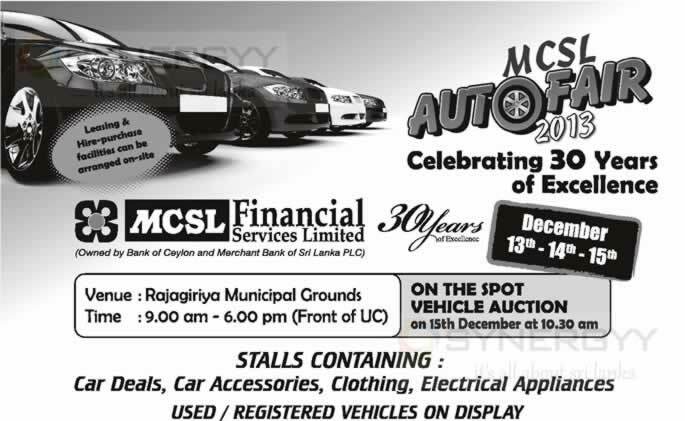 With the Celebrating 30 Years of Excellence MCSL Financial Service Limited offers an MCSL Auto Fire 2013 at Rajagirlya Municipal Grounds from 9.00 am – 6.00 pm (Front of UC). The auto fair will open for 13th to 15th December and on the spot vehicle auction will be held on 15th December at 10.30 am. 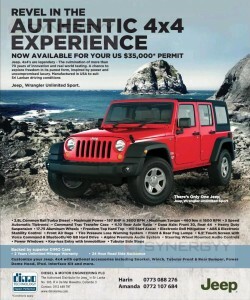 The DIMO announces special Promotions for the Jeep Wrangler Unlimited Sport 4X4 for USD 35,000 for your Permits. And customize your Jeep. 4×4 with optional accessories including Snorkel, Winch, Tubular Front & Rear Bumper, Power Dome Hood, iPod. Interface Kit and more. The Asia Exhibition and Conventions organises a Colombo Motor Show 2013 at BMICH from 6th September to 8th September 2013 from 10.00 Am to 10.00 Pm. The event is with wide range of automobiles showcasing in srilanka. such as latest cars vans and SUV and the Vintage cars of Sri Lanka too. 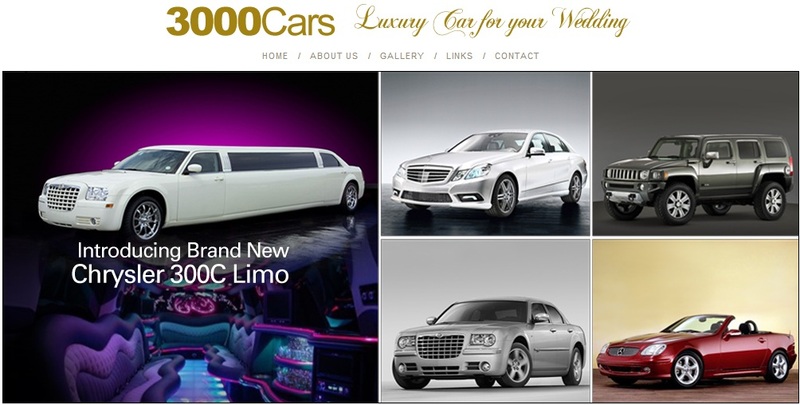 3000Cars offers the services of luxuries car services for your unforgettable event of Wedding, you could arrange luxury as you wish in range from Chrysler Limos to Hummer Jeeps. Make your wedding delightful with luxuries car. Srilanka Customs Announced that the 3 Years restrictions on the transfer of Duty Free Vehicle permits for Public Servants have been removed from Today (16th November 2012). This will be valid for the Permit Issued earlier as well. 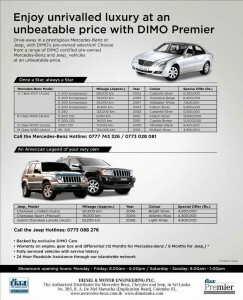 Drive away in a prestigious Mercedes Benz or Jeep with DIMO Pre owned Selection. 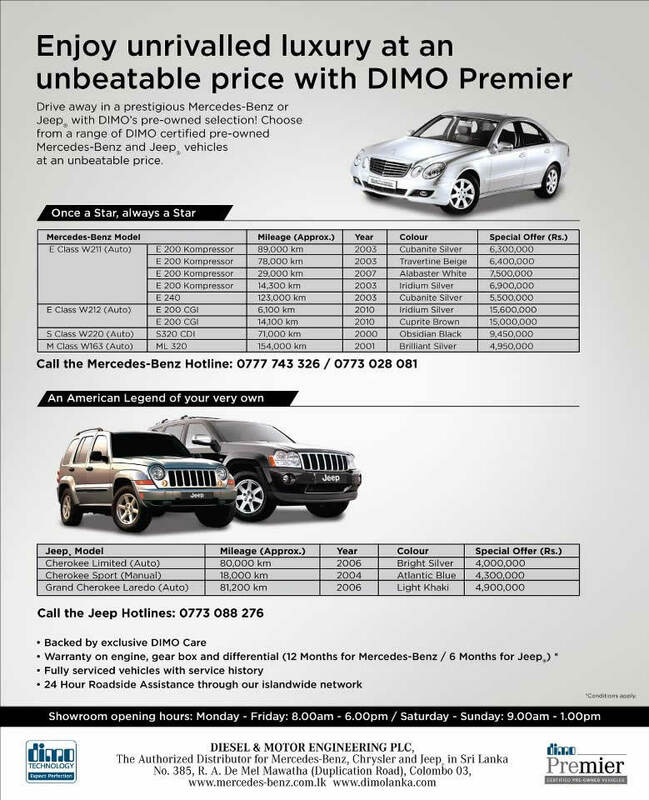 Choose from a range of DIMO certified pre-owned Mercedes Benz and Jeep vehicles at an unbeatable price. The DIMO Srilanka made an offer on 14th October 2012 to join on the trade up your Jeep & Chrysler and enjoy amazing offer from DIMO. 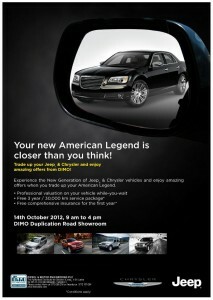 Experience the new generation of Jeep & Chrysler vehicles and enjoy amazing offers when you trade up your American legend.